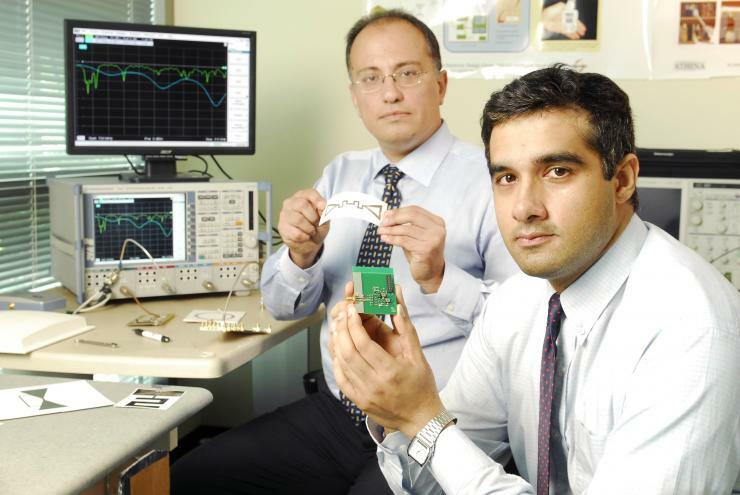 Emmanouil M. Tentzeris had one of the 25 most downloaded papers from the IEEE Sensors Journal for September 2013. Tentzeris’ coauthors are his Ph.D. student, Rushi Vyas, and his colleagues from the University of Tokyo, Ryo Shigeta, Tatsuya Sasaki, Duong Minh Quan, Yoshihiro Kawahara, and Tohru Asami. The paper appeared in the August 2013 issue of the journal. The team's paper, entitled "Ambient RF Energy Harvesting Sensor Device with Capacitor-Leakage Aware Duty Cycle Control," presents a software control method that maximizes the sensing rate of wireless sensor networks (WSNs) that are solely powered by ambient RF power. Unlike all other energy-harvesting WSN systems, RF-powered systems present unique challenges for energy management. A WSN node repeatedly charges and discharges at short intervals, depending on the energy intake. In this paper, Tentzeris and his colleagues introduce an adaptive duty cycle control scheme optimized for RF energy harvesting, which maximizes the sensing rate by taking into account the leakage problem, a factor that has never been previously studied in this context. The control scheme improves the efficiency by aggregate evaluation of operation reliability and leakage reduction. The proposed approach could find numerous applications in the realization of truly autonomous wireless nodes for the Internet of things, smart skins, structural health monitoring systems, and quality-of-life biosensors and chemical sensors. A professor in the School of Electrical and Computer Engineering at Georgia Tech, Tentzeris is among the world’s top researchers in conformal 3D integrated RF modules, inkjet-printed RF electronics, “green” electronics, and power scavenging. He is the chair of the electromagnetics technical interest group for 2013-2014 and leads the ATHENA Research Group, where he advises six Ph.D. students, five master’s students, and six undergraduate students. Tentzeris and his colleagues have published more than 520 refereed journal and conference papers.